For a SUP enthusiast, a high quality SUP leash is a vital piece of equipment because – well lets face it, unless you have donned a life jacket before your paddle, a carbon fiber or plastic sup paddle will not keep you afloat. While there are many leash brands in the market, it is important that you find a quality stand up paddle board leash that keeps you safe and is comfortable to wear. In this article I’ll review the 9 best SUP leashes, to help you choose the best one for you. Below are some of the best leashes, reviewed in detail. As much as all stand up paddle board leashes do the same thing, they have varying features and are suited for different conditions. Having a leash on does not have to feel burdensome—at least not with the premium leash from Own The Wave. You will easily forget that it is there. This leash is amazingly comfortable because of its padded neoprene cuff. There is a convenient hidden key pocket too. The coiling design eliminates any possibility of leash drag so there will not be snagging of submerged objects. The design also keeps your leash on the board and out of the water. It is easy to attach the leash to the board and you will get emailed instructions to help you through the process. Each Own The Wave premium leash is made of superior materials that assure you of durability. The 7.2mm cord is strong, yet lightweight. It has double stainless steel swivels for maximum safety and a high quality triple wrap rail saver. The manufacturer includes a waterproof waist carry for your essentials. You can carry it around your waist, shoulders or neck. There are so many reviews on the Own The Wave premium coiled leash and almost all of them are positive. It is sturdy and made of state of the art materials. The ankle cuff is comfortable and you can paddle for a long period of time without bruising. The coil design keeps it out of the way. There are very few negative reviews and they are mostly from riders who received a faulty leash. SBS (Santa Barbara Surfing) premium coiled leash is specifically meant for stand up paddleboarding and is ideal for flat water paddling. It lets you cruise the waters without hindering you yet keeps you safe in case of an emergency. The SBS is a high quality leash made with a sturdy 7mm urethane cord, a triple rail save rand new molded-in 316 stainless steel swivels. The padded neoprene ankle cuff is ultra comfortable and was even voted #1 over Dakine. 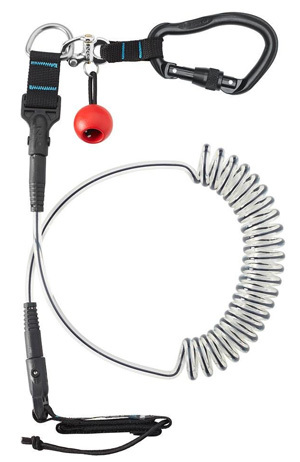 The coiled design prevents the leash from being all over and ensures no drag. 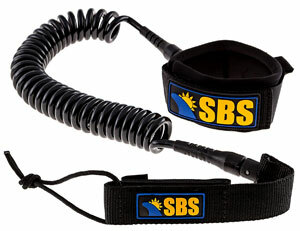 The SBS leash is heavy duty, able to handle even the heaviest paddleboards. Nevertheless, it is very flexible and lightweight since is it meant for flat water paddling. 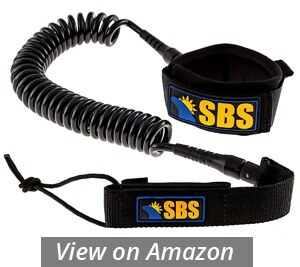 The SBS premium leash is great, judging from the reviews. It may not be from a renowned company but it is high quality. The cord is strong and the coils ensure no drag issues. It is soft and your comfort is well taken care of. There are no negative reviews on the SBS. The Storm Premium leash is a product of the reputable BPS. It is made to keep you safe without compromising your comfort. BPS made this leash based on feedback from SUPers to make sure it is exactly what users need. This iconic SUP leash is ultra comfortable with a padded neoprene cuff and you will even forget that you have a leash on as soon as you hit the water. As a bonus, there is a hidden key pocket. The firm coiling of the Storm Premium guarantees no leash drags and it will always be on you board and not in the water. The strap is adjustable to ensure a perfect fit for every paddler. It also has a great amount of Velcro so it does not come off. The cord is made of thermoplastic polyurethane and is remarkably durable. From the reviews, the Storm Premium 10’ leash is a great leash. It is sturdy and the Velcro is strong enough. The most commended feature seems to be the comfort of the leash. It is snug and users have testified that you will indeed forget that you are wearing a leash. Customers do not trust the dry pouch with their valuables. 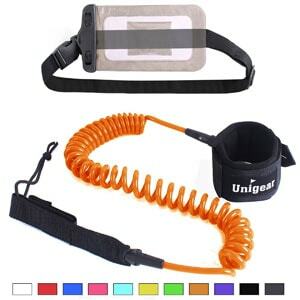 Unigear SUP leash will have you sorted in case of an emergency. Everything about it is quality and you can tell it was made with riders in mind. The cord is quite strong, made of a 7mm urethane cord and it can handle any board, however long or heavy. Despite the sturdy construction, it is lightweight and flexible. It is made with TPU elastic polyurethane and has a soft sponge at the ankle part to make it comfortable. The connection hardware is ultra durable, made of long lasting stainless steel. With the soft sponge, you will not experience chaffing and bruising. Moreover, the ankle cuff comes with a pull tab and a hidden key pocket. The connection hardware is not prone to sea water corrosion and will serve you for a long time. Included is a waterproof wallet to store your valuables as you SUP. The sealable case has an adjustable waist belt which can serve as a shoulder strap and an adjustable lanyard. The customers seem to be satisfied with the Unigear Premium leash. The cord is strong and poses no trouble even with heavy boards. The ankle cuff is comfortable; you will forget you are wearing a leash. Attaching and detaching is easy. The only downside seems to be the wallet proof case. Although it works fairly well, some users seem to have received ones with weak lanyards. 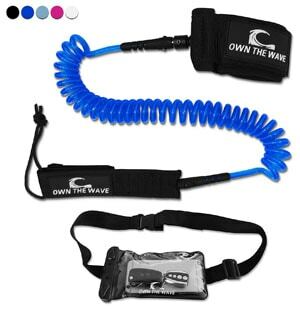 The ‘Nemesis’ from Own The Wave is a heavy duty leash that can weather any condition. Its cord is 7.2mm thick and is made of thermoplastic polyurethane. It can stretch to a whole 10’. The cord is firmly coiled which prevents snagging, dragging and kinking. The leash stays out of your way and out of the water. The stainless steel swivels prevent tangling to ensure an amazing experience and the triple rail saver protects your board. 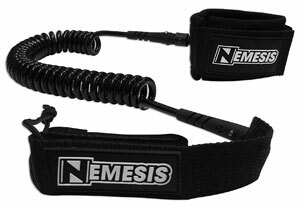 The ‘Nemesis’ Leash is great. It is strong, just as advertised and looks classy. The users have commended the comfortable ankle cuff. It is snug and is great for long distances. The quality is fantastic and it is durable. There is no dragging and paddling is very smooth. The lack of attachment instructions is an inconvenience to first time users. 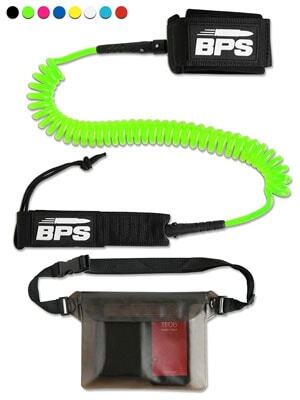 The BPS Storm Ultralite is an incredibly strong but amazingly lightweight leash. According to the manufacturer, BPS, it has been designed specifically for whitewater paddling. This leash is light enough to make you forget you have it on but strong enough to keep you safely attached to your board. The neoprene ankle cuff is padded for comfort and it has double stainless steel swivels. The strap is adjustable and has great Velcro so it will always stay on. The cord is firmly coiled which prevents snagging, dragging and kinking. It is super slim, at 5.5mm. Both the cord and the cord to swivel connector are made of heavy duty thermoplastic polyurethane. 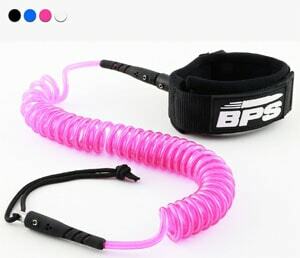 The BPS Ultralite is a great leash, judging from the reviews. The coils keep it from dragging and it does not tangle. The Velcro holds well and the cuff is very comfortable. It is made of quality materials and has assured durability. It comes in four colors and users are able to choose the one that goes with their board color. There are a few negative reviews about the lack of attachment instructions and for some users, the leash tangled. 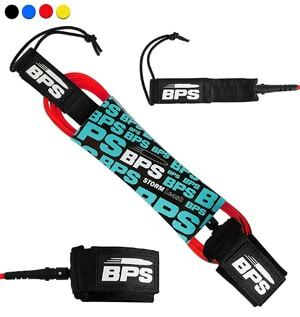 The Storm Surf and SUP leash from BPS offers you freedom of choice. It comes in four colors and six sizes for you to choose from. This leash has been made to last a long time. The 7.2mm cord and the cord to swivel connector are both ultra strong, built from polyurethane thermoplastic. It comes in different sizes, 5’ – 10’ and four different colors. The strap is adjustable and has a good amount of Velcro. The cuff is extra soft to prevent chaffing. Feel free to go for long distances with this leash on; the worst you can get is a tan. Included is a quick release tab with a hidden pocket key. Although it is not coiled like the above leashes, the Storm Surf and SUP does not tangle, thanks to the double stainless steel swivels. The Velcro might not hold if you are a hard surfer/SUPer. The Storm Surfboard and SUP Leash by BPS is a great leash. Users say that it does not drag or tangle and stays out of the water. The cuff is comfortable and does not leave bruises. For the price, they feel it is a fantastic leash. There are few negative reviews about the Velcro not being strong enough. Tagvo is a fairly new company in the industry but they make really nice products and this Tagvo SUP leash is one of them. 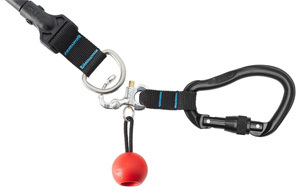 The firm coil design prevents the leash from dragging in water or snagging submerged objects. It stays out of the water and out of your way giving you maximum freedom. It stretches to 10’. The Tagvo SUP leash is comfortable as the ankle cuff is padded with neoprene. It fits all ankle sizes from 1” to 14” so it is suitable for the whole family. There is a nylon ring on the cuff to allow for easy releasing. The cord is made of 7mm TPU polyurethane making it strong and solid for whatever conditions. The swivels prevent any tangling. This leash can be used for surfing and SUPing. 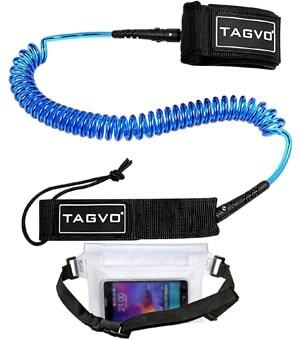 Despite the fact that Tagvo is not a household name, this leash has nothing but positive reviews. Users praise its high quality and great length. It is not all over the place and stays well out of the water. The few customers that trusted the waterproof bag with their smartphones say that it does not leak. There are no negative reviews on this leash. The NRS Quick Release is a waist SUP leash with a quick release. It is the best for SUPing in rivers for safety reasons. This leash is solid and well made from heavy duty materials, yet very light to allow you to glide freely in the water. It is coiled but stretches to let you move as you would like. It stays out of your way and out of the water. 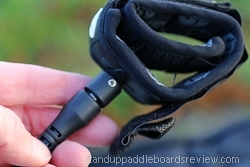 This NRS Quick Release is must for river SUP boarding. Users love how lightweight it is. Experienced SUPer or not, a leash is a must have. Your life is important and a leash may save it. The above leashes are all great; they offer comfort and fit so well. They are durable and some even come with a dry bag for your valuables. Besides, they are all reasonably priced so you really have no excuse. Get yourself a leash, will you? How long can you tread water for? In an enclosed pool you may feel capable of going strong for five to ten minutes, maybe a half hour if you’re in excellent shape. However, when you’re in a swimming pool, you have the safety of a wall or the stairs if you cramp up, or accidentally gulp a pint of pool water. You are an arms length or a stroke away to safety unless a vigilant lifeguard gets to you first. For a SUP enthusiast, a high quality leash is a vital piece of equipment for any stand-up rig because— well lets face it, unless you have donned a life jacket before your paddle, a carbon fiber or plastic sup paddle will not keep you afloat. Having a leash doesn’t only save you, but it keeps others in the water safe from injury. Some experienced swimmers and paddle boarders will say a leash is unnecessary or that they are bothersome. That a leash may trip you up and get tangled in between your toes or possibly give the appearance that you’re incapable of handling your board if you fall into the water. This way of thinking couldn’t be more wrong and in fact is a dangerous mindset. Most of the environments paddle boarders seek often hold the potential to separate the rider quickly from the board. Whether it be high surf, rip currents and rapids, or a sudden change in the weather, wind and water moves quick! Faster than most people can swim. And with immense natural power it will outlast anyone who ends up having to swim for their life. You may think “Well my board is twelve feet long and I usually fall right next to it.” Or “My board is as wide as a ship, I can catch it because it moves like a log.” That’s like saying “I don’t need a seatbelt when driving, because I can brace for impact with my arms and legs.” Accidents happen quick and nature is always unpredictable, especially on the water. If you have ever gone out on a SUP board you know it is the total opposite of driving a car. It is one of the most stress free and relaxing activities that provides an excellent core workout. The lax state of mind one reaches while paddle boarding can also be a distraction from the potential dangers of becoming instantly separated from your board. Alright so you fall in, just locate your paddle and swim back to your board before you step on an oyster bed or a clump of seaweed brushes your leg. It is routine to chase after a rogue board. But what if the board drifts further away than the paddle? Or if you’re surfing, a second wave rolls by and takes your board for a ride without you? Or if you’re stuck in the middle, which do you swim to first, the paddle or the board? What if all of a sudden your side cramps up or you pull a hamstring? Or you inhale water while trying to catch a breath? Or even worse, all three happen at once! Okay, it’s unlikely, but any one of those decreases the chances of making it back to your board. Consider yourself a goner if you are alone or separated from your pack of friends. It has happened before and will most likely continue to happen to the unfortunate souls who failed to wear a lifejacket or invest in a leash. For fifteen to sixty dollars you can insure your safety if such a scenario were to occur. If you fall off when tethered to a SUP leash, all you need is a quick tug, and your board is beneath your forearm, like a wall at the swimming pool. You never can predict the scenario you will get caught in on the water. When offshore or surfing, keep in mind the distance between you and others, as well as your distance off of the shoreline. If you are attached to the board, you are easier to find then if you were to be bobbing in the water with out your board. Recent advancements in leashes have provided the user extreme comfort, maneuverability, and even personal storage for paddle boarders. A proper SUP leash is made from polyurethane and is molded into the shape of a cylindrical cord for durable elasticity and buoyancy. One end of the leash contains a rail saver which is a double layered velcro connection attached to a five inch paracord. The paracord is the leash connection to the ring at the tail end of the board. At the other side of the leash is a neoprene ankle or upper leg cuff. This is also a velcro attachment that latches securely to the ankle or just below the knee. The cuff is usually attached to a stainless steal swivel to reduce any tangling and increases the ease of motion. What you’re primarily looking for when buying a leash is length, comfort, and maneuverability. A good leash will fit snugly with velcro that is easily attachable and removable. A good leash will fit snugly with velcro that is easily attachable and removable. New leash cuffs may take a few rips and re-seals to break in the velcro for easy application. A leash with impeccable velcro is a must since this is what keeps you tethered to the board. Obviously since the leash will be wet and put under stress, the velcro material must be durable with a solid stitch inlay around the outside fabric. A great way to check for a strong bond of velcro is the volume test. If you pull the leash strap and the velcro sound is crisp and loud, your buying a solid product. If it is a dull non-sticky-like scrape, it will most likely not withstand the stress and elements in the long run. Another factor to take into consideration is the stitching that holds the velcro and neoprene together to the outer layer of what is usually a vinyl or water resistant fabric type material. Before purchasing make sure the stitching is not unraveled or torn at the corners. Also make sure there aren’t any gaps between the layer of fabrics. This will cause discomfort, crookedness when latched, and eventually will unravel over time. Make sure to check the swivels as well. The hardware should be stainless steel to avoid rust and corrosion and should rotate smoothly. Typically when shopping for a SUP leash look for a thick cord, bulky strap, and a shiny neoprene inlay. These factors usually make for a strong, long lasting, and comfortable the leash. If you paddle in saltwater, make sure to always rinse with fresh water at the end of every session. What’s The Difference Between A SUP Leash and a Surf Leash? In the sport of traditional surfing, leashes range from six to ten feet depending on the size of the board. If you are riding a short surfboard, you want a shorter leash. If you are surfing a longboard you want the leash to be longer. This is primarily because short boarders do not walk the board when riding a wave and long boarders are capable of walking the board to the nose while performing pivot maneuvers in motion. When a surfer falls off, the board will continue with the wave and the leash will stretch then recoil back toward the surfer. A longer leash equals a safe distance between the rider and the board after wiping out. Nothing is worse than the tip of a surfboard being sling-shotted out of the water and at your face or body. A common way to avoid a close-call recoil is to buy a leash that is as long as your surfboard, or one that extends one foot longer past the nose.The surfboard leash is intended to drag behind the board for easier access to carving the wave and attempting tricks and cutbacks. While most short boarders wrap their leash around their ankle, long boarders will typically wrap the cuff around their calf muscle, right below the knee cap. This style of leash cuff is usually larger than the ankle cuff and is commonly the leash of choice in stand up paddle boarding. This allows for more freedom when walking the board while also keeping the leash from tripping up the other foot. However, the typical straight cord surfboard leash is less used in river or backwater SUP, but a variation of the straight-coil leash is used for SUP surfing and racing. The straight leash is not used for recreational SUP because in calm water, the regular surfboard leash hold more slack in the water and potentially catch debris beneath or on top of the surface. Also since most regular surfboard leashes are fitted only for the ankle, they will not produce a snug fit around the average rider’s upper portion of the leg. As stand up paddle boarding evolved over the years, so did new variations of the leash. There are three basic SUP leashes. The coil, Straight/coil, and the Hip Pack leash with pocket storage. All three provide safety and comfort to your style and needs. These styles are sold by many traditional SUP and surf brands and can be found online or at your local SUP shop. Made from the same materials as the traditional surfboard leash, the coil leash differs from the slack-style and keeps the paddle boarder tethered with less tangle and slack. 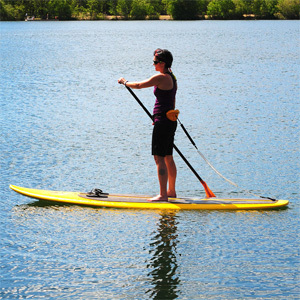 This allows the user more access to walk the deck of the board while also keeping the leash from dragging in the water. Typically a good choice if you paddle in lakes, rivers, or back bays. Like an old house telephone cord from the eighties, the coil will maintain a length of less than three feet, and will stretch to ten or more feet when needed. The coiled SUP leash is cool for the relaxed feeling of the sport, and can still function sufficiently if the rider decides to take to the surf or rapids. Aside from the coil leash is a combination of both styles, the straight/coil SUP leash. This involves the traditional straight leash style along with the coil and is used for SUP racing and surfing. This leash has about one foot of straight cord before the rail saver and another foot of straight cord before the cuff. The coil separates the two sides and remains acting as a space saver as in the picture below. This leash is typically used for the extreme side of SUP. It gives the rider more space between the coil section and allows for more maneuverability and less interference with the coil when finding optimal footing and stance in a race or on a wave. This provides the ability to walk the full length of the board as well with less tangle one would find with a traditional straight leash. The Hip Pack leash is a favorite for recreational, river-rapid riders, and long distance paddle boarders. The leash is typically the coil style that attaches around the backside of the hip pack and is a commonly used by riders with leg or ankle issues. Not only is it hardly felt because it attaches directly to the hip pack, it also clears even more space for both legs and keeps your stuff from getting completely soaked! Keep in mind some brands offer complete dry storage while others don’t, so before purchasing, make sure you know if it is a full dry storage compartment. This is a great pocket space for phones, wallets, snacks, first aid, or multi-tools when out on the water. Most hip packs are vibrant in color and easily visible. Some even contain a pull cord for a Co2 activated inflatable lifejacket incase of an emergency. This leash is typically for the relaxed and prepared rider and not only is it cool, it’s hip! Literally. What Leg Does this thing go on? This is a common question and one that has a simple answer. Your dominate leg is usually the limb of choice to strap your leash to. This is because your dominate leg is often stronger, more versatile, and psychologically probably just feels right. If you don’t know which leg is your dominate leg consider which one you use to kick a soccer ball. However the leash can go on either leg when paddle boarding in a stance that aligns square with your shoulders, but if you decide to turn sideways, when riding a wave or down the rapids of a raging river, you want the leash to be on the back leg that remains on the tail end of the board. If you wear the leash on the front leg in this stance, it will potentially cause the cord to wrap around your opposite leg and a sudden trip up will lead to an immediate nose dive or wipe out. So whether your in the wobble stages of SUP or you’re trekking from island to island like you’re Laird Hamilton, safety is the most valuable mindset to have when on the water. A leash is never a bad piece of equipment and most brands are relatively cheap and reliable. This purchase will increase your chances of survival if a wave or an undertow current decides to divide you from your board. Unpredictable weather and unexpected experiences happen all the time so be prepared. Refuse to sink and think now about purchasing a SUP leash, rather then watching your board drift away while flailing and thrashing awkwardly with only your paddle for support.